A Midwest company will use the Rivergate Terminal to export the fertilizer component to Asian markets. A Midwest agribusiness company will enter the Portland market by leasing a port on the Willamette River to export anhydrous ammonia, a potentially hazardous material used for fertilizer, industrial processes, and even the illicit manufacture of methamphetamine. 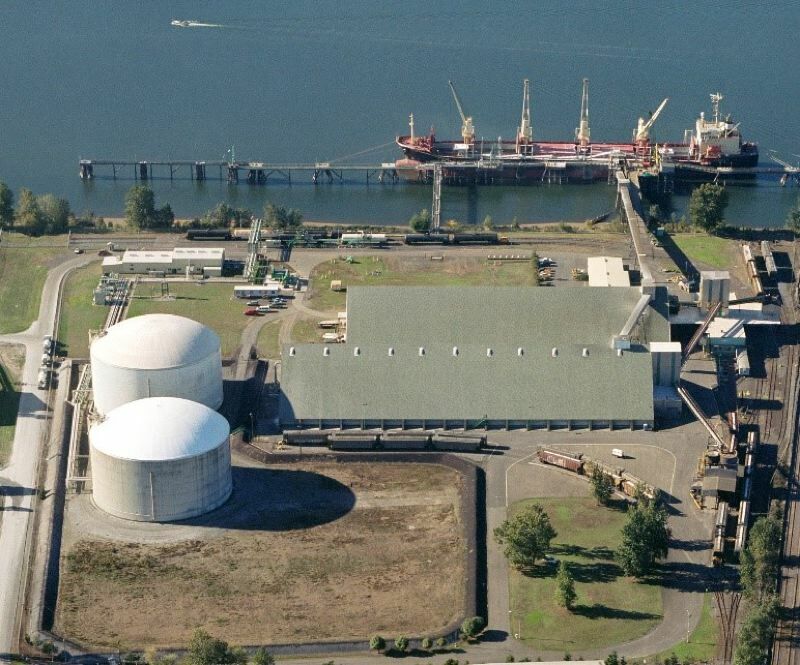 Deerfield, Illinois-based CF Industries announced it has reached a deal with Boise-based J.R. Simplot Co. for use of Simplot's Rivergate Terminal, which has two 25,000-ton ammonia tanks at the North Portland facility, considered the largest deep-water ammonia terminal on the West Coast. The site has been used to store and distribute anhydrous ammonia for decades. Simplot has reduced its use of the site over the past year since completing its own anhydrous ammonia manufacturing plant in Rock Springs, Wyoming, said Josh Jordan, Simplot spokesman. The company has been using the site to store anhydrous ammonia and transport it in pressurized liquid form via rail cars and trucks to markets throughout western North America. Simplot also ships urea from the terminal. CF did not respond to an interview request, but stated in a news release that it will transport anhydrous ammonia to the terminal produced at its Medicine Hat, Alberta, Canada, nitrogen complex, and then ship it to growing export markets on the Pacific Rim. A typical rail car can hold 78 tons of liquid ammonia, Jordan said. Some neighbors and environmental groups have raised safety concerns about the new operation. However, the site has been used to store and transport anhydrous ammonia since the late 1960s or early 1970s, Jordan said, and the capacity of the facility will not change. "We'll still operate the facility," he said. "We will follow the same very strict guidelines that we always have." On its website, Simplot boasts of the Rivergate facility's "exemplary safety and environmental record." Simplot has not experienced any accidents or releases within the ammonia plant operation, Jordan said. The Oregon Department of Environmental Quality determined that no air quality permit is needed because the existing one will suffice, said DEQ spokeswoman Laura Gleim. No other permits are needed for the change in operations, Jordan said. The terminal is located at 14003 N. Rivergate Blvd., north of the St. Johns residential area, across the Willamette River from Sauvie Island. Anhydrous ammonia is used in fertilizer, water treatment and the pulp and paper industry. According to the U.S. Centers for Disease Control, "when handled improperly, anhydrous ammonia can be immediately dangerous to life or health." The federal agency calls it a "colorless gas with pungent, suffocating fumes." Referring to the potential for accidential human exposure, the CDC explains that "as liquid anhydrous ammonia is released from its container into the air, it expands rapidly, forming a large cloud that acts like a heavier-than-air gas for a period of time. Because the vapors hug the ground initially, the chances for humans to be exposed are greater than with other gases. … Exposure can be fatal at high concentrations." Simplot's website says the first ammonia tank was built at the terminal in 1972 and the second one in 1980. Simplot bought the terminal in 2000.